In recent quarters we have exposed the hyperbole of doom-and-gloom evidence while expecting a first-quarter 2018 double-digit stock market correction. We have shown that the stock market margin debt ratio is normal, credit card and mortgage default rates are low, while credit spreads, junk bonds, yield curves and inflation risks are calm. Adding to the positive backdrop in this economic expansion is the massive sideline liquidity in search of corporate assets as well as shares of stock. Global mergers and acquisitions (M&A) had their best start ever in 2018, totaling $1.2 trillion as the value of M&A deals increased 67% year over year. M&A volumes doubled in Europe in the first quarter, while the United States was up 67% and Asia increased by 11%. Excess cash, US tax reform, and faster economic growth in Europe has unleashed the urge for dealmaking. Private equity firms have enjoyed strong managed asset growth, hitting a record $2.5 trillion. This excess liquidity in a low inflation world of easy credit bodes well for stocks and underlying multiples until the global economy overheats. 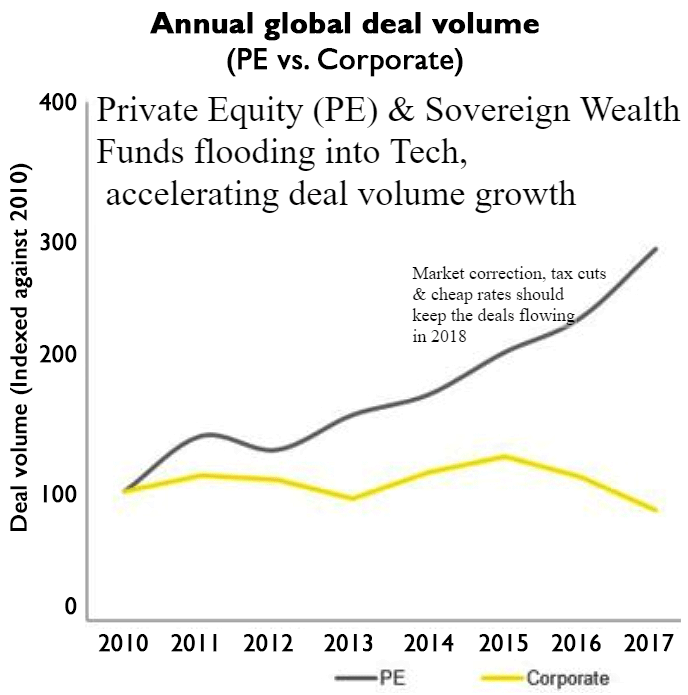 While a record $1.7 trillion in PE cash is piling up on the sidelines, aggregate deal values are significantly lagging, 42% behind levels of 10 years ago. 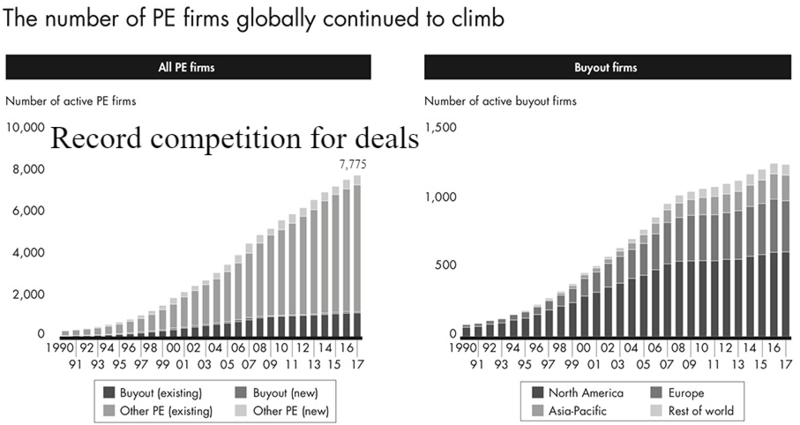 Global buyouts by private equity firms hit $440 billion in 2017 with a hefty 11 multiple, while the number of quality targets decreased due a very competitive atmosphere. Add-on deals, whereby PE firms acquire companies to bolt-on to existing portfolio companies (buy-and-build stratagems) are part of the effort to utilize the funds and generate the return investors demand. While China dominates the target list, Europe and the US have struggled to expand their deal-making supply of candidates commensurate with demand. The money is calling around the world but struggles to find enough people to pick up the phone. The increasing level of dry powder, coupled with investor expectations pressures PE firms to make timely investments, which ups risk and valuation multiples. With too many dollars chasing too few goods, valuations will remain elevated in 2018. These higher multiples will drive the trend of adding value to single deal or an add-on platform focusing more resources on operational expertise. With PE firms raising capital easily for deals outside of their fund pool, it signifies a large amount of shadow capital on the sidelines. Shadow or dark capital results from investors bypassing traditional PE managers, using direct or co-investments and segregated accounts where margins are lower. Moneylenders are now seeing the total debt of 5 times Ebitda, with equity of 40 to 50%, which means financial buyers prioritizing return on equity (ROE) will bid 9 to 10 times Ebitda or higher. In the small-cap world of deals valued between $10 million and $250 million, valuations have risen to 7.4 times Ebitda, the highest in 14 years of tracking. Deal debt has also reached a record high of 4.6 times Ebitda. This may seem like an overheating market, but short of a stock market crash or a drastic reduction in interest rates due to a recession, the high valuations should remain for now. 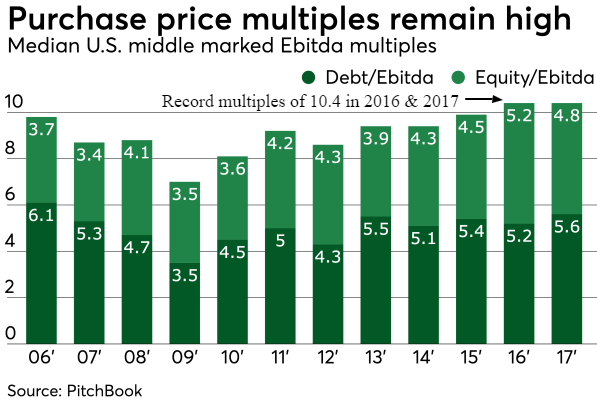 With nosebleed multiples, PE firms are re-calibrating their approaches, often by lowering ROE, lengthening holding periods and accelerating the closing process. This trend provides sellers more cash at closings, smaller escrows, and more two-step auctions, where potential buyers compete for the bidder's list. The PE field has doubled in size during the past decade with 5,000 firms controlling more than $2.8 trillion in assets and creating 25 private-equity billionaires in 2016. Apollo Global Management raised a record $24.6 billion private-equity funds in just six months and North American PE firms raised a record $272 billion in 2017. A small sample of China’s importance to PEs going forward is exemplified by the fact they have more Unicorns (valuation > $1 billion) than all other countries combined. China also has the five most valuable startups. For 2018, 68% of executives at US-based corporations and 76% of execs at domestic PE firms say deal flow and size will rise compared to 2017’s sweet spot of $500 million to $5 billion. Themes for 2018 include: A major focus on divestitures, with 70% of both corporate and private equity respondents say they plan to sell assets in 2018, up from 48% in 2016. Of PE respondents, 60% expect a greater focus toward bolt-on acquisitions to build scale. Industry and sector convergence with a strong bias toward vertical integration should grow. Cross-sector transactions should continue to be a major factor, such as Amazon buying Whole Foods in 2017 or Walmart trying to buy Humana in 2018. 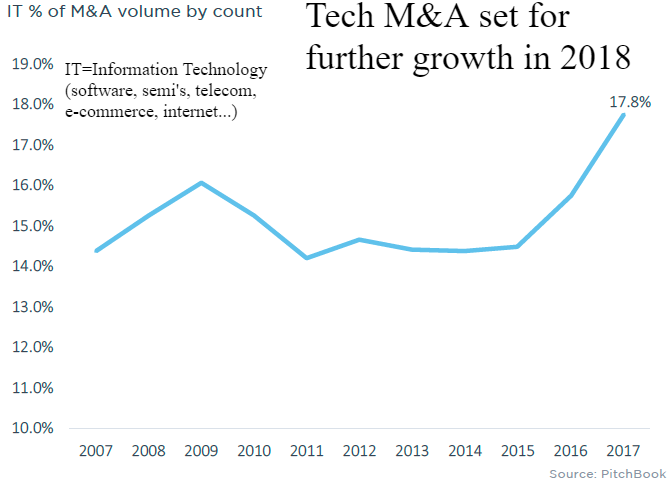 Finally, tech M&A and China are strong growth areas in 2018. 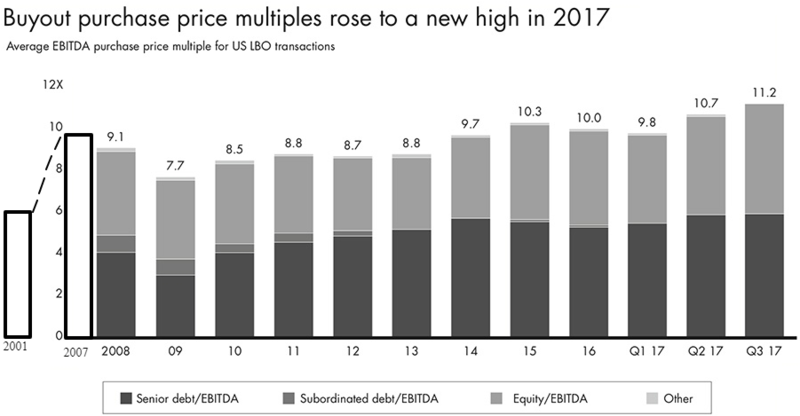 Unlike 2017, companies are sending strong signals that they intend to aim for bigger M&A targets this year. One of the few drags on large-cap buyouts has been rising regulatory risk. Trump blocked Singapore-based Broadcom’s $117 billion bid for US chipmaker Qualcomm and the Justice Department is attempting to nullify AT&T's $85 billion deal to buy Time Warner. Add the recent attack on Amazon and it’s clear this President fears potential monopolies and the foreign acquisition of US entities. However, mountains of excess liquidity will need to find a home to the benefit of stock shareholders and companies needing capital. Our expected stock market correction in the first half of 2018 should provide the pause that refreshes, barring any missteps in geopolitical trade war brinkmanship.